The Rig Combo G2 system combines wastewater treatment, generation and other key features. Water protection is always an important consideration when preparing a site for a work camp, drill pad or other operation that brings many crew members onto a location for lengthy periods of time. Industrial water is always top of mind, but wastewater generated by sanitation rarely gets discussed. Tightening provincial regulations surrounding work sites is making it a concern, however. As provinces like Alberta and British Columbia move forward with the need for greater treatment of wastewater, companies have begun exploring newer ways of handling the needs of crews at remote sites. Filterboxx has been working in the on-site treatment sector for some time, Kroll said, with an eye for the regulatory environment. “What we’ve tried to do is provide tertiary quality water with disinfection to meet today’s standards and what we think the standards will be going forward under western Canadian regulatory bodies,” he said. The company’s Rig Combo treatment system has been in operation for some time, with a steady evolution of treatment approaches. Activated sludge and membrane bioreactor approaches have been considered previously, but Filterboxx has found that moving bed biofilm reactor (MBBR) systems are a better fit for remote sites. “MBBR offers more flexibility in terms of its capacity to handle the wastewater we see in rig operations or in camps, and provides a cost-effective solution compared to some other technology,” Kroll said. Filterboxx has taken a packaged approach to its systems, with the entire unit able to be delivered on a single skid wherever it may be needed. It is kept within a small footprint to reduce the amount of space operators must dedicate to wastewater management on site. 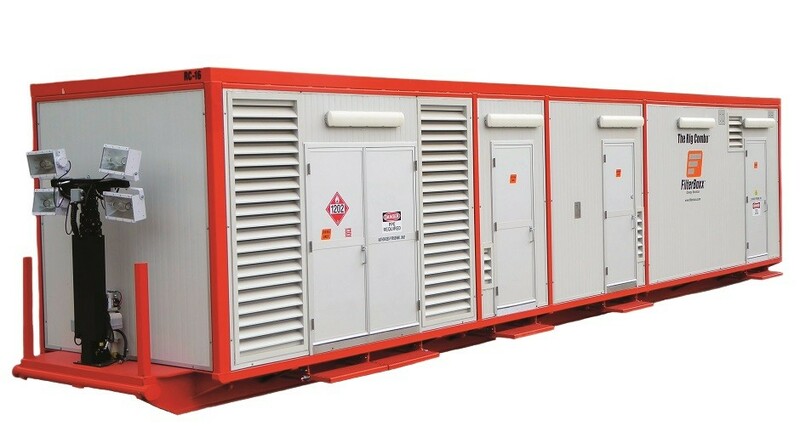 Recently released, the Rig Combo G2 (Generation 2) units consist of a pressurized MBBR and filtration wastewater treatment system capable of handling the demands of up to 50 people, along with 7,000 litres of water storage. In addition, other equipment is attached. The system, which also includes builtin yard lighting and a safety washroom with emergency eye wash and industrial washing machine, is designed to function in all weather conditions. “The container is able to maintain freeze protection in cold winters and has ventilation systems for summer operations,” Kroll said. Maintenance of the units is handled by Filterboxx staff from numerous sites. Kroll said the system is designed to be modular based on site population. Multiple units can be placed on site, and if the number of crew members changes they can be added to or removed easily.